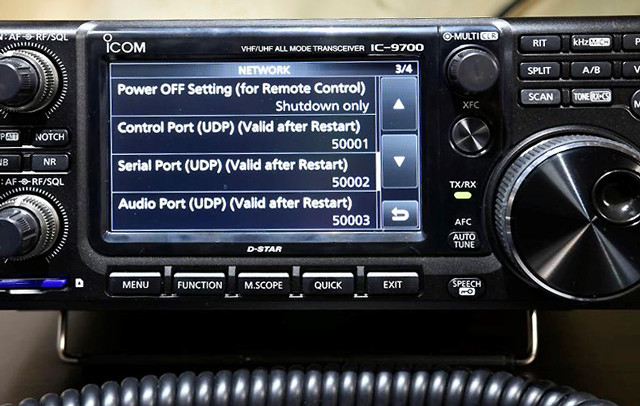 IC-9700 front panel (courtesy Icom Inc.) Click for larger image. 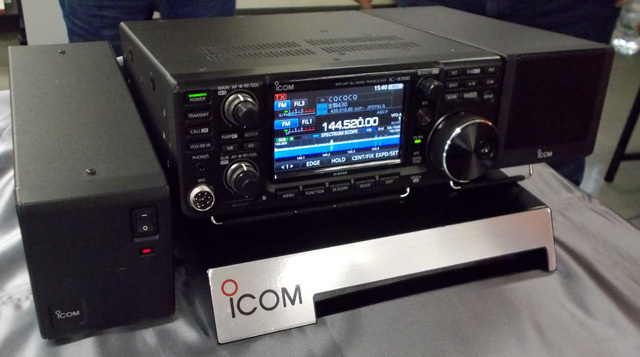 IC-9700 rear panel (at Tokyo Ham Fair). 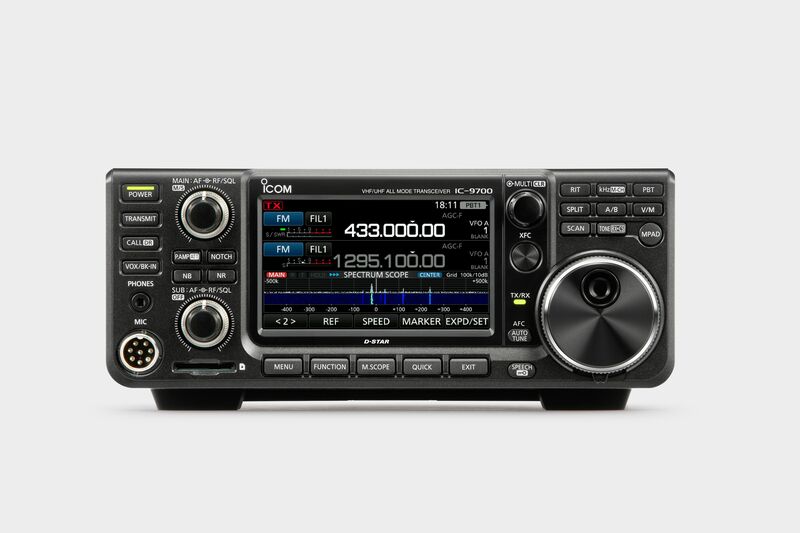 IC-9700 with PS-126 & SP-34 at APDXC 2018. 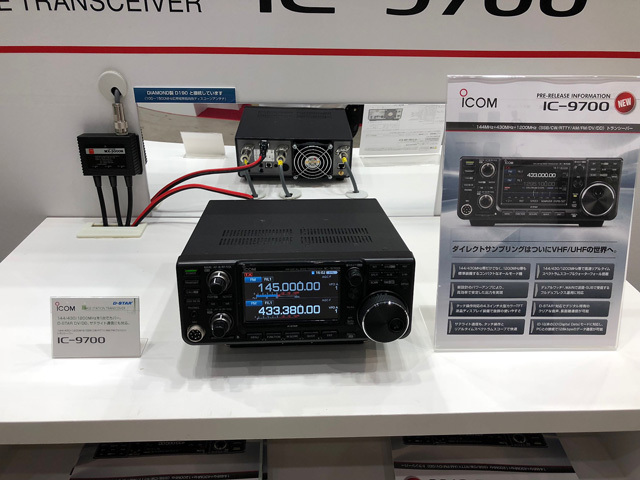 IC-9700 on display stand at Tokyo Ham Fair 2018. IC-9700 network screen (from one of my Icom sources). IC-9700 D-Star screen (from one of my Icom sources). 3-band, all-mode transceiver covering 144, 430/440 MHz and 1.2 GHz bands. EUR: 144-146, 430-440, 1240-1300 MHz. 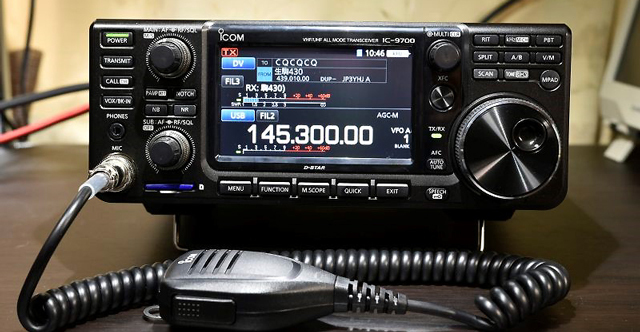 Modes: SSB (J3E), CW (A1A), RTTY (F1B), AM (A3E), FM (F2D/F3E), DV (F7W), and DD (F1D). Receiver: RF direct sampling on 144 and 430/440 MHz, analogue down-conversion/digital IF sampling on 1.2 GHz. 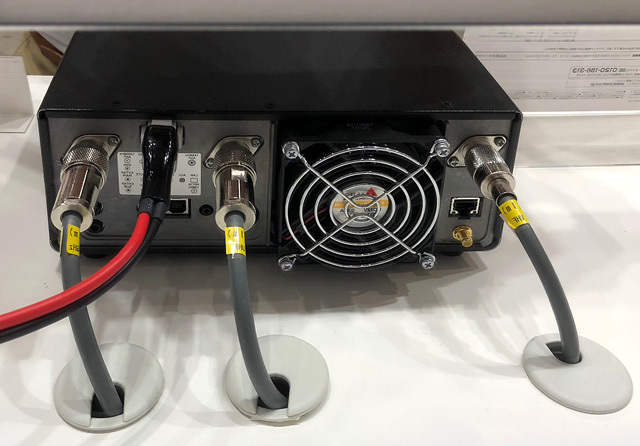 Transmtter:Direct digital up-conversion (DUC) on 144 and 430/440 MHz, DUC to IF and heterodyne up-conversion to 1.2 GHz. 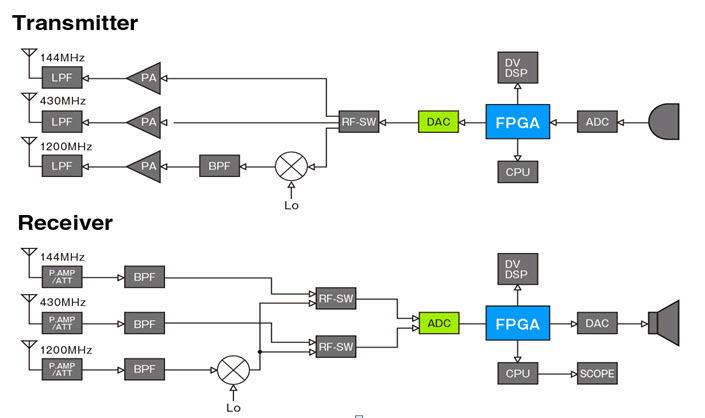 Common ADC and DAC for 144, 430/440 and IF bands. Direct RF sampling on 144/430 MHz and low-noise LO in 1.2 GHz down/up-converter provide improved RMDR/phase noise performance. Fast real-time FFT spectrum scope/waterfall with maximum ±500 kHz span. 10 MHz external reference input (SMA) on rear panel. Frequency auto-calibration using external reference signal. Newly designed RF power amplifier featuring high efficiency, stable output and energy-saving. TX power output:144 MHz, 100W; 430/440 MHz, 75W; 1.2 GHz, 10W. Power feed and remote control for masthead preamps. Real-time, high-speed spectrum scope for all 3 bands. Dual Watch, and full-duplex for satellite operation. Dual Watch with Main and Sub on different bands/different modes. Normal and reverse satellite configurations with easy operation. Full D-STAR® Digital Voice (DV) support. DD (Digital Data) mode for datacom up to 128 kB/s. Standard ICOM DSP selectivity filter set, available for all modes. 144 MHz antenna socket: SO-239. 430/440 MHz and 1.2 GHz antenna sockets: N. USB-B and Ethernet (LAN) ports on rear panel. 8-pin DIN ACC socket on rear panel. SEND line (ACC Pin 3) enable/disable via menu for each band. SD card slot on front panel. Compatible with RS-BA1 V2 and new RS-MS1A Android remote control app (downloadable from Google Play Store). Built-in gateway (resident server) function equivalent to RS-MS3A/RS-MS3W. No co-located server PC required. Copyright © 2019 A. Farson VA7OJ/AB4OJ. All rights reserved. Images: contributors as noted.